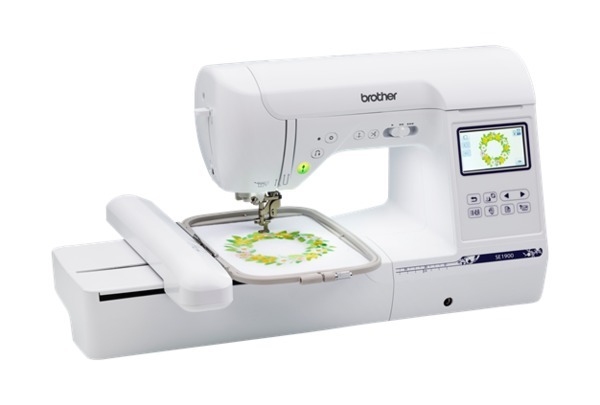 Designed for the ultimate sewing and embroidery experience, the Brother SE1900 delivers an impressive set of high-end features and a wide selection of included accessories. *Synchrony 6 Months No Interest Financing, Equal Monthly Pay plus any applicable taxes. Transaction Code 106. Apply online. Synchrony will advise you of the maximum amount or full credit that you can use towards purchase. 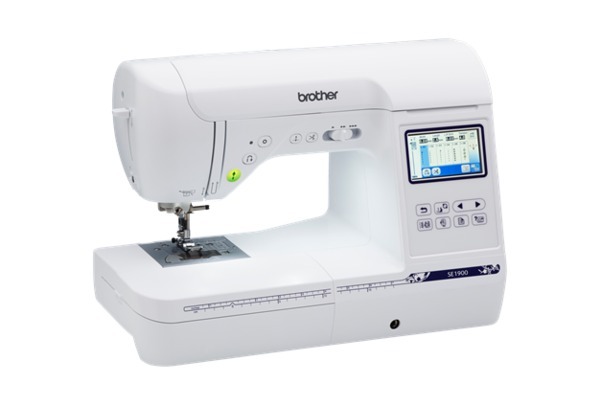 The Brother SE1900 sewing and embroidery machine is simply unique! With a total of 336 embroidery 136 built-in designs, you are bound to transform your clothing into unique pieces of art. The 5" by 7" embroidery frame give you plenty of room to embellish anything from home décor items to your favorite jeans. Features such as advanced needle threading system, automatic thread trimming system and adjustable machine speed allows for an easy and effortless experience. 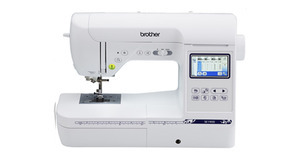 The Brother SE1900 Sewing & Embroidery machine is simply unique! Expansive 5x7 inch embroidery field provides space for larger designs, along with a 5x12 inch multi-position frame allows you to combine designs with less rehooping. 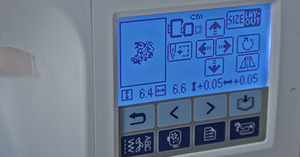 View designs and editing options on the large, backlit LCD display screen. Includes 136 built-in embroidery designs and 6 embroidery lettering fonts. Designs include beautiful scrollwork, florals and quilt patterns, plus 10 frame shapes with 12 border styles. 184 built-in sewing stitches, with 10 buttonhole styles and an extensive array of decorative stitches such as scallop, smocking, shell tuck, heirloom and drawnwork. 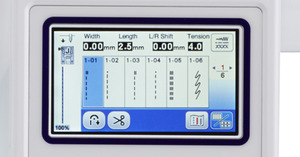 Use the sideways sewing feature for applique and cylindrical sewing. 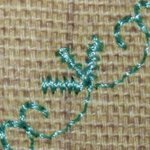 Design your own decorative sewing stitches with the My Custom Stitch feature, and use the sideways sewing feature for applique and cylindrical sewing. Virtually unlimited embroidery design options, with built-in memory. Import designs with a USB stick (not included), and store your purchased or custom edited designs to built-in memory, for future use. 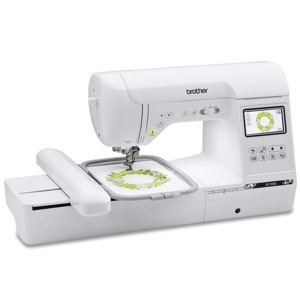 Includes hard machine case and 11 sewing feet, with a buttonhole, overcasting, monogramming, zipper, zigzag, blind stitch, button fitting, stitch guide, adjustable zipper piping, non-stick and open-toe feet. The versatile Brother SE1900 computerized sewing and embroidery machine is designed for the ultimate sewing and embroidery experience, with its extensive range of 184 sewing stitches, 10 buttonhole styles, 136 embroidery designs, 6 embroidery lettering fonts and maximum 5x7 inch embroidery field. Beyond the built-in sewing stitches and embroidery designs, this model allows you to design your own sewing stitches and import purchased embroidery designs, for virtually unlimited creative options. Included is a generous selection of accessories, with a 5x7 inch and a 5x12 inch multi-position embroidery hoop, hard protective carrying case for easy transport, embroidery foot, 11 quick-change sewing feet and more. As a Brother embroidery customer, you’ll gain exclusive access to iBroidery.com, where you can download 1000’s of designs, from edgy to floral, with a wide selection of Disney and Nickelodeon designs. 2015 Brother International Corporation. All rights reserved. Disney. The SE1900 uses standard .pes design files, so you can import designs purchased from www.ibroidery.com and other 3rd-party sites. The versatile Brother SE1900 computerized sewing and embroidery machine is designed for the ultimate sewing and embroidery experience, with its extensive range of 184 sewing stitches, 10 buttonhole styles, 136 embroidery designs, 6 embroidery lettering fonts and maximum 5x7 inch embroidery field. Beyond the built-in sewing stitches and embroidery designs, this model allows you to design your own sewing stitches and import purchased embroidery designs, for virtually unlimited creative options. Included is a generous selection of accessories, with a 5x7 inch and a 5x12 inch multi-position embroidery hoop, hard protective carrying case for easy transport, embroidery foot, 11 quick-change sewing feet and more. Work Space (Height & Width) inches	4.1" x 7.4"
Machine Dimensions (H x W x D)	13.43" x 23.19" x 11.54"
Shipping Dimensions (H x W x D)	19.57" x 20.08" x 22.44"
Brother SE1800 Sewing & Embroidery Machine Overview. Sewing & Embroidery machine w/ 5"x7" embroidery field, 136 embroidery designs, 6 fonts, extensive range of sewing features (184 stitches, 10 buttonholes, My Custom Stitch for creating custom stitches, 11 feet). High end features at an affordable price. FYI - this is our highest-priced mass machine, retails at Amazon for just under $1200. Same basic machine as the dealer-version SB8000. A great machine. 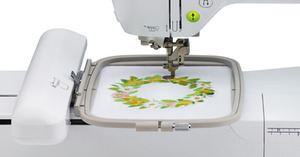 SE1800 Sewing and Embroidery Machine with 136 Built-in Embroidery Designs. 184 Sewing Stitches The built-in stitches include an impressive array of decorative stitches such as scallop, smocking, shell tuck, heirloom and drawnwork. Large 5x7 Embroidery Area Stitch individual designs up to 5x7 inches with this larger embroidery field. Included are 2 hoop sizes – a 5x7 inch and a 5x12 inch multi-positionable hoop, so you can combine designs with less rehooping. 136 Built-in Embroidery Designs Included are beautiful scrollwork, florals and quilt designs, plus 10 frame shapes with 12 border styles. Use the design editing features to rotate, mirror-image, increase and decrease the design size. Import Embroidery Designs Use the USB port to import designs from a USB stick, or import designs purchased from iBroidery.com and other web sites. 10 Professional, Elegant Buttonholes 10 styles of built-in, one-step buttonholes are automatically sized to fit your specific buttons, for a true designer finish. 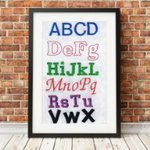 6 Built-in Embroidery Lettering Fonts Choose from the selection of built-in script, outline, serif and san serif fonts, and combine them with built-in or purchased designs for truly customized creations. 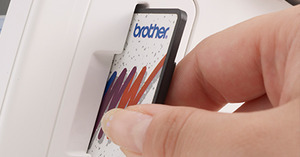 Design Your Own Sewing Stitches With the exclusive Brother My Custom Stitch feature, you can design your own stitches, and save them to the built-in memory. A must-have feature for all creative sewers! Sideways Sewing Use the sideways sewing feature for applique and cylindrical sewing. With this feature, you can actually sew horizontally, in addition to vertically – imagine sewing in a square without rotating your fabric! 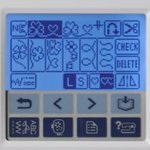 Easy View, Backlit LCD Display Screen With the touch of a button, you'll select your stitch, and then see the stitch you've chosen clearly displayed on the convenient LCD display screen. Protective Carrying Case: The hard protective carrying case protects your machine from dust and makes it easy to take to classes. The case also includes a convenient outer storage compartment. 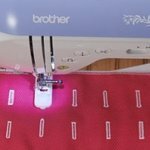 11 Sewing Feet: The generous selection of quick-change feet include buttonhole, overcasting, monogramming, zipper, zigzag, blind stitch, button fitting, stitch guide, adjustable zipper/piping, non-stick and open-toe feet. Included Accessories: In addition to the 11 sewing feet and hard carrying case, included are an embroidery foot, embroidery thread spool, 4 bobbins, a twin needle, needle pack, kneelifter, storage compartment and more. Easy-to-See, Super Bright Work Area: The brightly lit sewing area is especially useful when sewing on dark fabrics, and for positioning multiple embroidery designs in the hoop. Variable Speed Control and Start / Stop Button: The stitch speed slide lever gives you control over how fast or slow you want to sew. The start / stop button gives you added precision in stopping and starting stitching. Advanced Easy Needle Threading System: Just press the lever on the side of the machine, and the SE1800 automatically pushes the thread right through the eye of the needle. Jam Resistant Quick-Set Top-Load Drop-in Bobbin This exclusive Brother bobbin system helps provide reliable, even stitch quality. The clear-view bobbin and bobbin cover allow you to see when you’re running low on thread. SE1800 is latest new model Brother embroidery machine that still has the card slot for 100's of pes format pre-programmed design cards on the market. Karen N recommends Allbrands.com Baton Rouge: "Ms. Karen and Natalie were both super helpful while I learned how to use Brother embroidery machine. They have gone over and above every time I visit All Brands Baton Rouge." Bonnie took my order she was very nice and helpful .